A grading scheme is a set of criteria that measures varying levels of achievement in a course. Course-level grading schemes are grading schemes that can be defined at both the course level and the assignment level. Without a grading scheme, scores are not measured against any specific standard. You can enable a grading scheme created by your institution, or you can add a new grading scheme specific to your course. View a video about Grading Schemes. 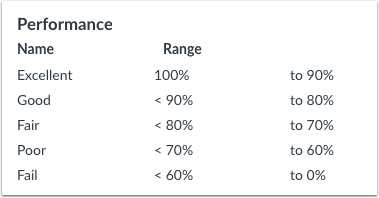 Grading schemes are built based on percentage ranges, and each percentage range is assigned a name value. 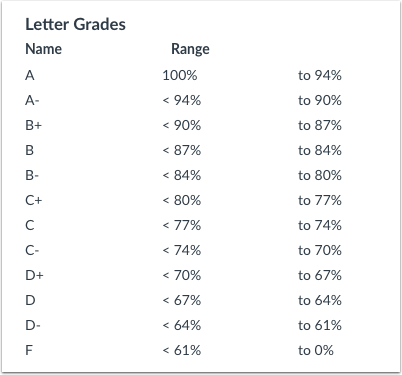 You can create any type of grading scheme by editing the name and percentage range for each item. When enabling a grading scheme for a course, the grading scheme is applied to the students' final grades in addition to the overall percentage. Grading schemes only support two decimal places. The only scores allowed in the Gradebook are those defined in the grading scheme. Gradebook entries that are not specifically defined in the grading scheme revert back to the icon showing that the submission needs to be graded. Depending on an assignment's display grade, some Gradebook entries cannot convert to a grading scheme. Letter Grades is the most traditional type of grading scheme and is the default format for new grading schemes. Only supported scores are allowed in the Gradebook, so if you build a letter grade scheme with name values for only A, B, and C, you cannot enter a score that converts to an A- or B+. Performance grading schemes are based on a standard of individual performance. Only supported scores are allowed in the Gradebook, so if you build a performance scheme with the name values of only Excellent and Poor, you cannot enter a score of Good. When enabling a grading scheme for a course, the grading scheme is applied to the students' final grades in addition to the overall percentage. Learn how to enable a course grading scheme. 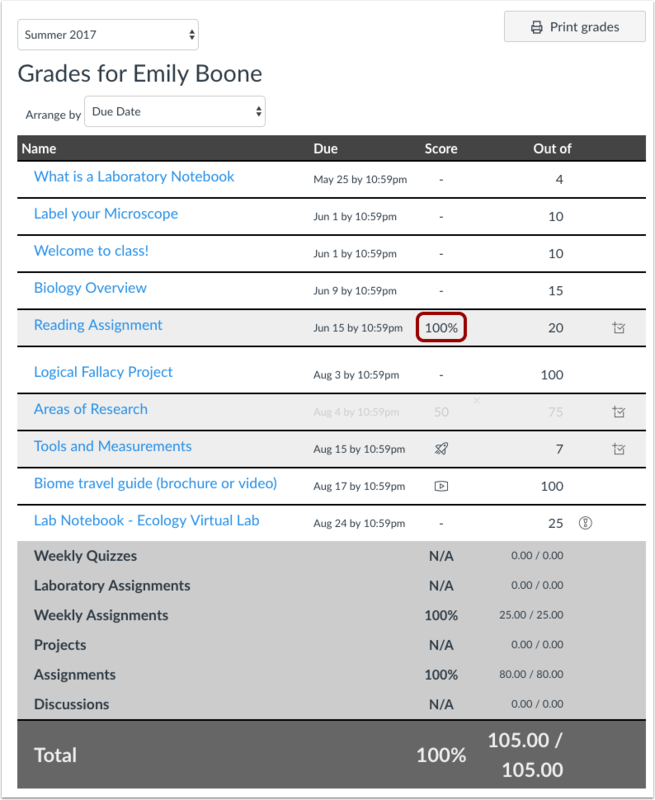 When grading schemes are enabled, students only see percentages in their overall total grades (unless it is changed to points in the Gradebook). Grading schemes can be applied specifically to individual assignments. Each assignment includes a field that allows you to choose how the grade is displayed in the Gradebook and in the student Grades page. Learn how to enable an assignment grading scheme. For any assignment type, you can enter grades as points or a percentage. For instance, if an assignment is worth 10 points and the student earns 9, you can input 9 or 90% (which displays the grade defined in the percentage range). When an assignment grade display is specifically set to Letter Grade, you can also input a letter grade directly, such as an A-. For Performance schemes, you can input scores in the Gradebook by points, percentage, or performance value. For instance, if an assignment is worth 10 points and the student earns 9, you can input 9 or 90% (which displays the performance defined in the percentage range). You can also input a performance value directly. Note: Grading schemes do not apply to Assignment Group columns in the Gradebook. 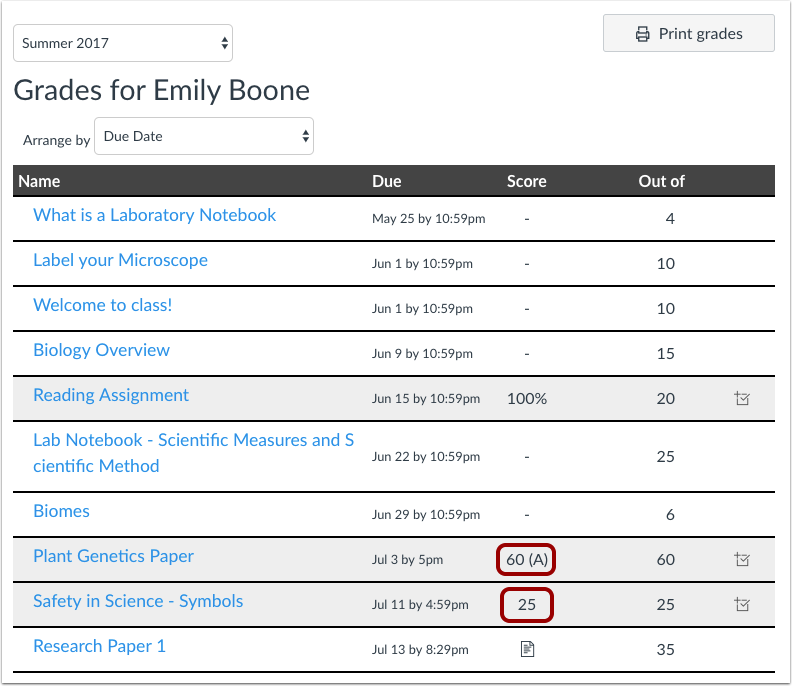 In assignments, students can see their grades displayed with both the points earned and the grading scheme equivalent. Previous Topic:How do I change the language preference for a course? Next Topic:How do I view grading schemes in a course? Table of Contents > Settings > How do I use grading schemes in a course? Re: How do I change grading rubric percentage on Total column? Re: Why is my total column not displaying a letter grade?